The software version used for this application note is the Elveflow® Smart Interface V2. Need advice to use your pressure pump like a syringe pump? This picture shows the microfluidic setup that will be used for this application note. The Elveflow® pressure control instrument used in this note is the OB1 MkII pressure controller, but we could just as easily have used an AF1 Premium pressure generator for this task. As often as possible avoid using soft tubing (like Tygon) which involves compliance and then increases the response time of the system. If you’re not familiar with microfluidic tubings, you may read our dedicated tutorials. The following diagram illustrates the complete chain of elements involved in this application note. You will need to assemble all those parts to set up your experiment. 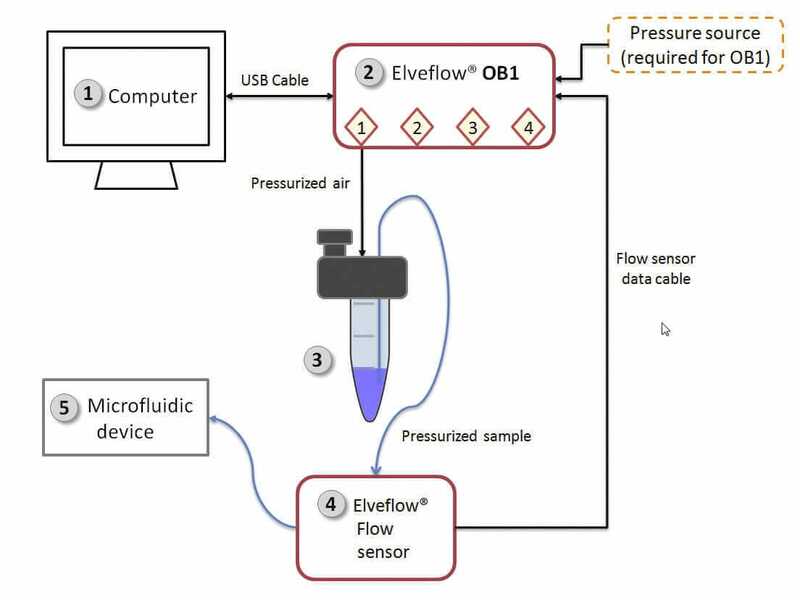 Using the Elveflow® smart interface to monitor a determined liquid mass flow rate. Be sure that all the cables and tubing are well connected to your Elveflow® (USB cable, 24V DC, Flow sensor data cable, etc). Perform leakage tests and remove any air bubbles before starting your experiment to ensure a good flow rate regulation. Knowing what fitting is best suited for your needs is a first step towards success. If you’re not familiar with microfluidic fittings, you may read our specific tutorials. The flow sensor is very sensitive to vibrations and movement perturbations so it is recommended to fix it to a stable surface as often as possible. Step 1 - Open the Elveflow® Smart Interface in the computer and select the instrument which is going to be used (OB1mix01 in the example case). Step 2 - Click on the “flow sensor” button and select the sensor range that it is going to be used on the corresponding channel. (50µL/min on channel 1 in the example case). Step 3 - Choose the reservoir size (Eppendorf 1,5 mL in the example case) and the sample amount (also 1,5 mL in the example case). Step 4 - Back on the main window, activate the flow button on the pertinent channel (channel 1 in the example case) and set a flow rate value in µL/min (30µL/min in the example case). Please, note that at the beginning, the reservoir’s color is red but at the moment the flow rate is stable it becomes blue. Step 5 (optional) - If needed, it is possible to see a graph display by clicking on the “open graph display” button. Set the desired maximum and minimum shown parameters on the display window for pressure and flow rate and press the play icon to launch the pressure and flow rate profiles display. Select the channels you want to display by ticking the corresponding boxes on the channel display selection block. Congratulations! You’ve achieved the flow rate control using an Elveflow® Flow sensor and the Elveflow® pressure control instrument!